We get a lot of random videogame-related crap sent to us. Sometimes it's interesting, like this box of Rick Roll sent to us by the makers of Dante's Inferno. Some of it is not, like the bottle of water I received from somebody, at some point, advertising something I've now forgotten. Today, however, is a day that will go down in infamy as the day I received a box of frozen meat, courtesy of Twisted Pixel, the makers of 'Splosion Man and the upcoming Ms. 'Splosion Man. As you can see from the attached image, it's pretty good meat, too. 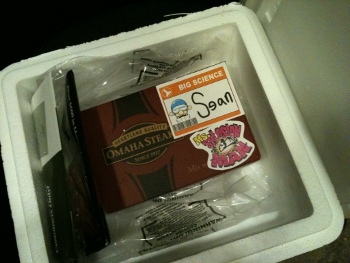 Frozen steak from Omaha Steaks. It's so good, in fact, I feel a little guilty accepting it. If I didn't think it would ruin in the mail, I'd offer to send it to one of you lot as a reward for correctly guessing something over Twitter. Instead I'll have to make it into an open-faced loose meat sammich. Or wear it as a dress. Or something. In any event, this just makes me all the more curious to see what will come of Ms. 'Splosion Man, the sequel to one of the most surprisingly fun games of 2009. Ms. Splosion Man features bigger levels, pumped-up bosses, overhauled networking, ghost replays, and countless other improvements in a fifty-level single player campaign and separate fifty-level multiplayer campaign. Ms. 'Splosion Man will be released on July 13th via Xbox Live Marketplace for 800 points. The meat, however, is available now. For me. Via the office freezer.